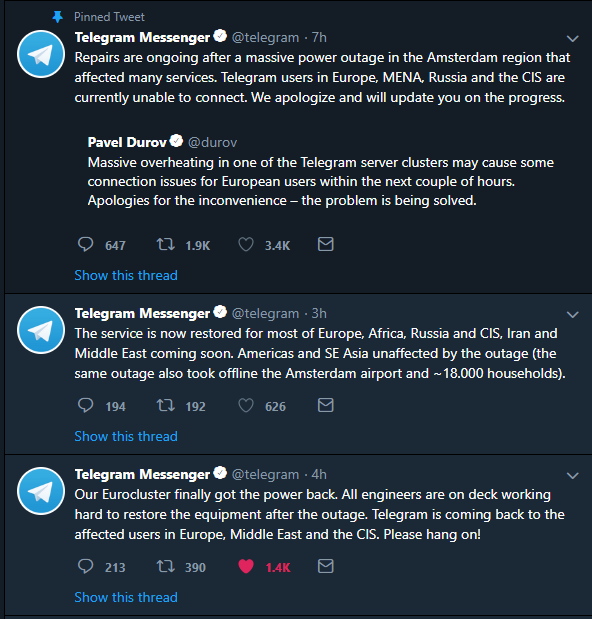 During the night 28th to 29th of April 2018, the messenger service Telegram had a power outage problem, which resulted in their service not been able to use in most parts of the world. 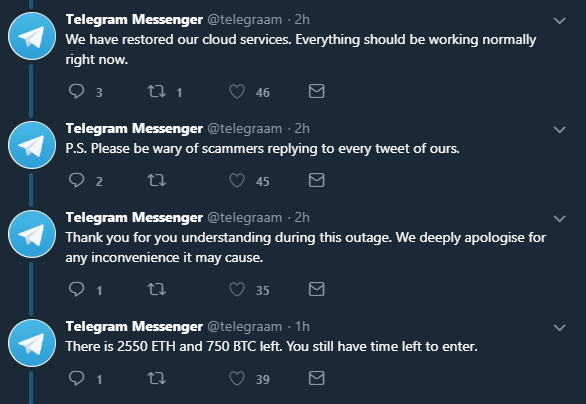 On Sunday morning (29th of April), the service comes up again and Telegram was informing about this on their Twitter account, which has at the moment 446K followers. At the same time, when opening one of the posts in detail you could see the following answer / reply posts which look like they are coming from Telegram as well but they are not. Checking in detail you see that the post is not done by @telegram, it’s instead made by the account @telegranm with a misspelling name. After reporting this account it was suspended by Twitter and it took not long time until the next comes up with the name @telegraam with the same posts. 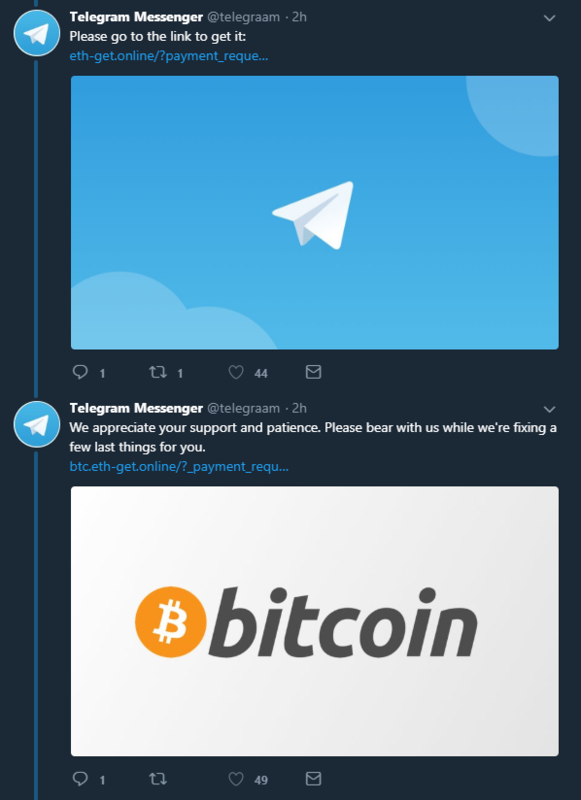 They even go so far and copying Telegram’s original post message, posting it again in their name, and also warning about “Scammers”! Making advertisement that there are still 750 BTC left as giveaway. 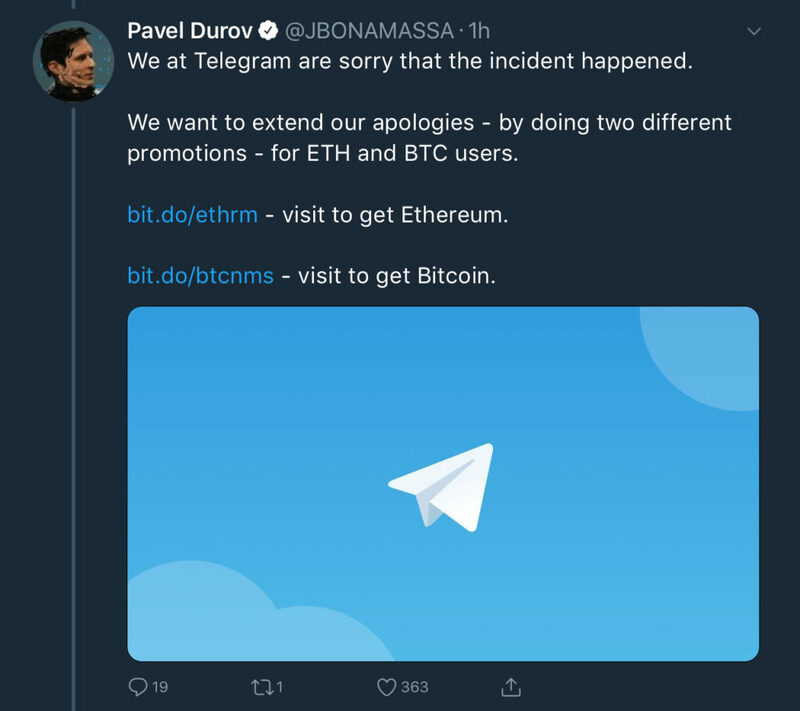 The post below is from @telegraam and not from the real @telegram Twitter account. 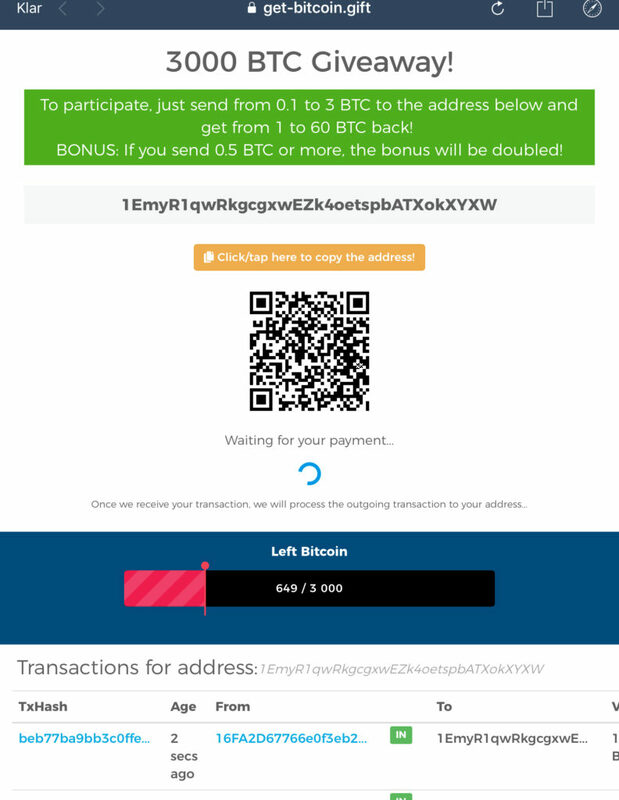 This scam is been reported by a lot of users, but at the same time, you see a lot of users reporting “Thanks” “received btc” or “works“. Reading the names of those accounts approving it’s working, all of them are looking Russian. – Are we surprised? Not really as Russia recently blocked Telegram. But this is maybe just a coincident…..
And here comes another one, in case the first account get’s blocked by @club8music . 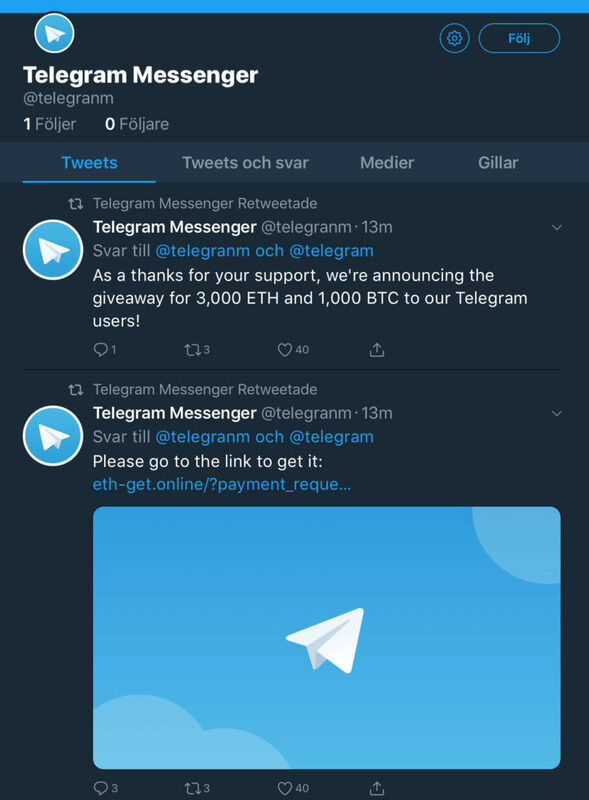 Ok, let’s look at the links they are posting, where we can get 3.000 Ethereum or 1.000 Bitcoin as a “giveaway” from Telegram. You are going to a page where you are asked to participate by sending at least 0,1 BTC or up to 3. And you are getting 1 to 60 BTC back! If you pay 0,5 BTC or more, the bonus will be doubled! – Really!? How much are you giving away if you would pay? (not to Telegram) (calculated by BTC value 29th of April 2018). How much giveaway are you getting (or not) by 1 to 60 BTC’s? 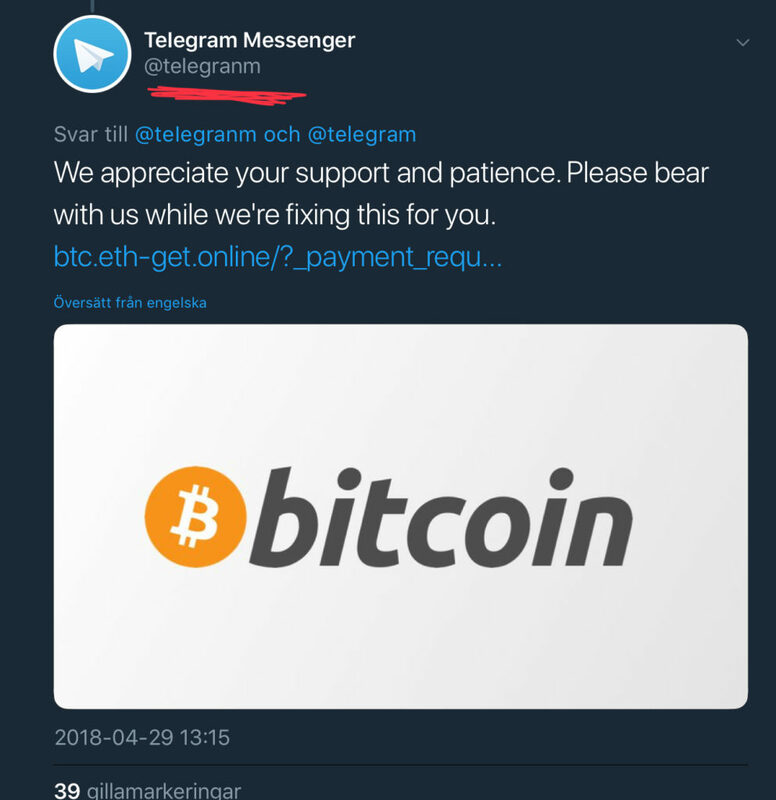 So in total Telegram gives way 9.323.000 US$ in Bitcoin. Really? Not to forget the total 3.000 ETH (Ethereum) which are 2.046.000 US$. Incident’s at largely used messenger services, are been miss used by Scammers. Scammers are faking companies and CEO’s twitter account to fool users. 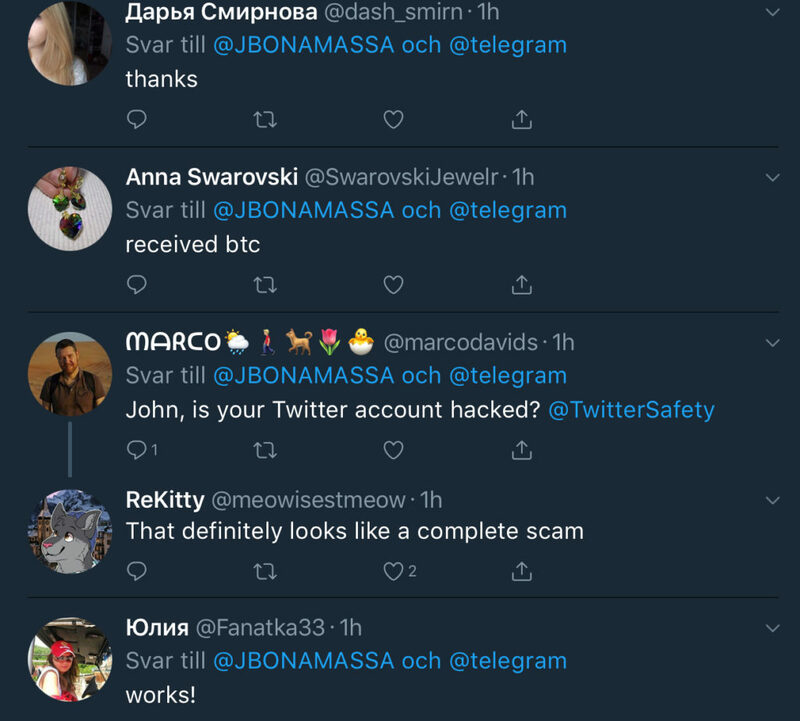 Reporting those Scams as I did in my Twitter post, does not help much, since the scammers are creating fake accounts looking like normal users, who approve the scam is working. They even post from the fake account that they are aware of scammers posting between their posts. – Really rude. Finally, you as a user or reader of those Twitter posts, use common sense! Do you really thing Telegram gives away 11 Million US$ in Bitcoin or Etereum?